After much deliberation, staff at the BBC Sport website have come up with their top-10 British fighters, pound-for-pound. Ignoring weight, this subjective list takes into account fighters' recent results, their skills, resilience and punching power. The list will be updated periodically and should be treated as a talking point. Let the debate begin! Froch was outclassed by American Andre Ward in the final of the Super Six but could become a world champion when he fights IBF title-holder Lucian Bute in May. Khan lost his world titles to Lamont Peterson in December but gets the chance for revenge in May. A defeat for Khan would leave his career in tatters. Burns gave a polished performance in beating Paulus Moses and remains on a collison course with Essex fighter kevin Mitchell. That could be a classic. Brook completely outclassed domestic rival Matthew Hatton in March and stands on the verge of a world title tilt. Has plenty of options in a talent-rich division. Cleverly outpointed American Tommy Karpency in February and the rather uninspiring performance suggested the Welshman needs to be stepped up in class. Macklin gave another gallant display in losing to middleweight king Sergio Martinez in New York. 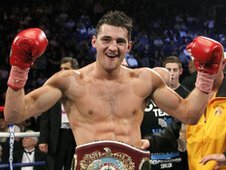 Perhaps a match with domestic rival Darren Barker is next? Barker pushed Argentine veteran Sergio Martinez all the way in a world-title challenge before finally being knocked out. British fight fans would love to see a match-up with Macklin. Murray was unlucky to draw with Felix Sturm in the German's backyard but forms part of a triumvirate of very solid British middleweights indeed. Mitchell looked back to his best in beating domestic rival John Murray in July. The fight every British fight fan wants now is Mitchell versus Burns. Next up Bellew defends his British light-heavyweight crown against Danny McIntosh in April. Given his stirring display against Nathan Cleverly, Bellew should prevail.